After you make the final climb up the hill on the Quintynne Hill Farm driveway, the first thing you might notice is how different the land looks on the other side. All along Coleman Bridge Road on your way to the farm outside of Aiken, you pass hundreds of acres of flat fields: horse farms, huge cotton fields and polo fields. Quintynne Hill Farm is not flat – it looks like Pennsylvania, with rolling hills, and meadows ringed by trees. Toi Trent and her husband Sandy own Quintynne Hill Farm. Toi is from Aiken, but she and Sandy were away from the area for several years because Sandy's job with the DuPont company took them to New Jersey, where they lived near the Pennsylvania border. Toi had always loved horses. She had never really had the chance to be around them very much, but she was always thinking about them. While they were living in New Jersey, Sandy convinced her to take the opportunity to get involved with them. She started volunteering at the New Jersey Equestrian Center, cleaning stalls, feeding and caring for the horses that lived there, and eventually taking riding lessons. It wasn’t long before she realized she wanted to take up eventing. She got a part time job working for Johanna Glass at her farm in Pennsylvania, caring for horses and taking lessons there. Then she purchased her first horse, Royal Circus, from Denis Glaccum. She fell in love with the idea of becoming a horseman. When Toi and Sandy returned to South Carolina in 1988, they knew they wanted to move back onto a farm. “"We immediately started looking for a farm," says Toi. "We knew we wanted something that looked like Pennsylvania because we fell in love with the terrain there. Wherever we bought, we knew we wanted it to be hilly and full of trees. We found 50 acres of woods on Coleman Bridge Road that seemed perfect. We started clearing to build a house and a barn where we could take in boarders who could also enjoy our new space." In 1992, Sandy and Toi moved onto the new farm and things started moving right along. Toi held her first combined training show in 1993. The show was recognized by the South Carolina Dressage and Combined Training Association (SCDCTA), a local organization with close to 200 members whose main objective is to promote dressage and combined training in South Carolina. "When I first started having shows here, we would have as many as 40 or so riders," she says. "People would come to our schooling shows to practice for the bigger, more formal shows. There were not that many other shows in the Aiken area back then, and there was a real need for a place to go and practice all the things you would need to know to compete in either dressage shows or three day events." As the years passed, the shows started attracting more and more riders. "In the late 1990s it was not uncommon to have as many as 100 riders participating in one of our schooling shows," she says. "When we started having shows here it seemed like most riders were using our show as a chance to get ready for a bigger recognized show. I’m not sure when it changed, but now it seems like a larger number of riders are here competing because it's so much less pressure than a big recognized show, and they are happy competing in just the schooling shows." In her own riding career, Toi decided that she would rather concentrate more on dressage and less on combined training. In 1996, she took her first dressage clinic with Charles de Kunffy, a famous clinician, instructor and judge. "Charles is a extremely articulate instructor; he is a true educator," says Toi. "His clinic taught me how to train my horses using a systematic program, and how to listen to and learn from my horses. Horses can teach us lessons in the virtues we need in our daily lives − responsibility, self awareness, trust, self control and patience." In 1998, Toi completed a dressage instructor program taught by de Kunffy and started implementing his principles in her own teaching style. Today she has about 10 students working with her, and enjoys helping them to become well-rounded horsemen as well as better riders. She also has several of her own horses in training and is competing regularly up and down the East Coast. In 2006, she was working with JJ Tate, a trainer from Maryland, and competed one of her horses, Wjedro, at the Prix St. Georges level. "We accumulated enough points to win the USDF Silver Medal," says Toi. "And I also rode another horse, Jordan to a Bronze Medal." "I’m working very hard to be prepared for the USDF Regionals in Lexington, Virginia," she says. "I’ve already qualified and hope to do well." 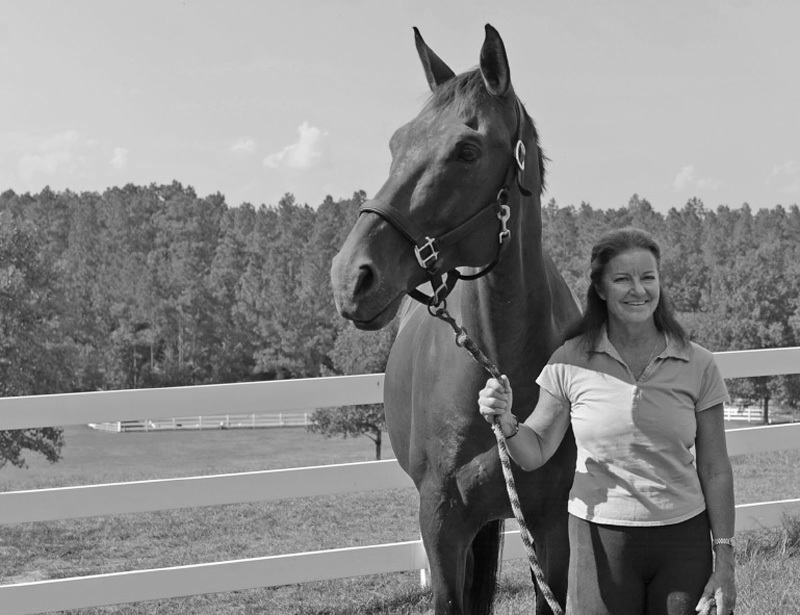 In addition to running schooling events at her farm, Toi has remained active in the promotion of her sport, and currently serves as the president of the SCDCTA. "I love being a part of the SCDCTA," she says. "I believe in our goal of making quality competitions available to everyone who is interested. I encourage everyone who has ever thought about competing at a dressage show or a combined training show to come and join our association or participate in one of our schooling shows. I’m sure you will enjoy it." Amy McElroy is a USEF R judge, qualified to officiate at any USEF recognized show at all national dressage levels. She rides, trains and teaches at Fairlane Farm in Aiken and judges about a dozen dressage shows and events each year. 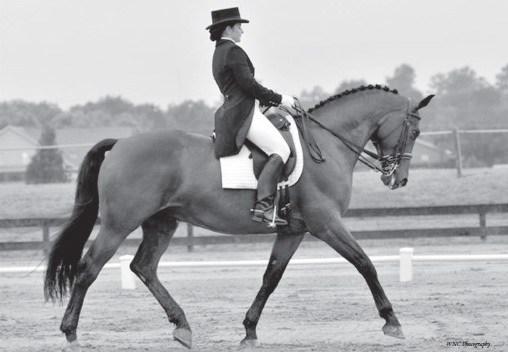 In her popular Ask the Judge column, she answers readers' questions about dressage. I am new to the Aiken area and hope to be showing late this summer and this fall. I have a problem: My mare is very reactive to bugs on her head. We are not used to the gnats that you have here! When I school my horse, she wears a fly hood with ear keepers and this solves my problem. I was wondering if fly hoods are legal at recognized shows? I have seen horses in magazines wearing fly hoods. My friend says I should just ask the judge before I go in for my ride. Could you please clarify? Welcome to Aiken. I am delighted that you will be competing in this area. The gnats can be a bit bothersome this time of year, so I do understand your dilemma. First, let's look at the USEF rulebook for both the dressage and the eventing divisions. The 2011 USEF Dressage Rule DR121, Saddlery and Equipment, contains two relevant sections. DR121.7: Fly hoods (ear covers) will only be permitted in order to protect horses from insects. The fly hoods should be discreet and should not cover the horse’s eyes and will only be permitted in extreme cases at the discretion of the presiding judge(s). Permission must be granted prior to the class, and applies to all competitors in the class. DR121.8: Fly hoods (ear covers) that do not cover the horse’s eyes are permitted in warm-up and other training areas. The 2011 USEF Eventing Rule EV115, Saddlery, also has two sections that pertain to fly hoods. EV115.1: Exercise Areas. The following restrictions begin @ 3 PM of the day prior to the start of the entire competition: . . . Fly shields and nose covers are permitted. EV115.2e: Dressage Tests. Any form of blinkers, including earplugs, hoods, fly shields, nose covers, are under penalty of elimination, strictly forbidden. However, under exceptional circumstances, fly shields may be permitted by the ground jury. So according to the rules in both dressage and eventing, it is possible to ride with a fly shield under certain circumstances, if you have been granted permission. I would recommend checking with the show management or the technical delegate the day you arrive at the show, before the competition. If you have been granted permission to use a fly hood on your horse, make sure your judge knows this before you go in to ride your test. You can talk to the technical delegate or show management about how to confirm with the judge. If the judge does not know that you have permission to use a fly hood, and you use one, you might be eliminated. Just because you see other riders competing in fly hoods, do not assume that they are legal at that show, even if the riders using them are professionals. For all you know, the other competitors using fly hoods may be being eliminated! It is definitely not advisable to wait to ask for permission to use a hood as you go around the apron of the arena awaiting the signal to enter for your test. Having this discussion when you are just about to show takes time and could throw off the schedule, especially if you have to dismount and remove a fly hood. This is not fair to the show management or the other competitors. If you do use a fly hood, I recommend that it be tasteful, conservative and neat. If you are wearing one in the warm up, where it is always legal, but not in the test itself, do leave ample time to remove it. You do not want to have a late entry, which is another possible reason for elimination. I think that many shows are willing to accommodate fly hoods. Judging around Aiken and neighboring areas, I have seen permission granted to use these hoods in the dressage phase of several events. So far, however, I have never seen a fly hood at a dressage show. In fact, the first time I ever saw a fly hood at a dressage show, it was in a recent photo of the professional, Gunter Seidel, competing in an FEI class in Austria. His fly hood was well-fitted and color-coordinated to his attire. Here's wishing you much success. Remember, fly and gnat season will be gone sooner than you think.